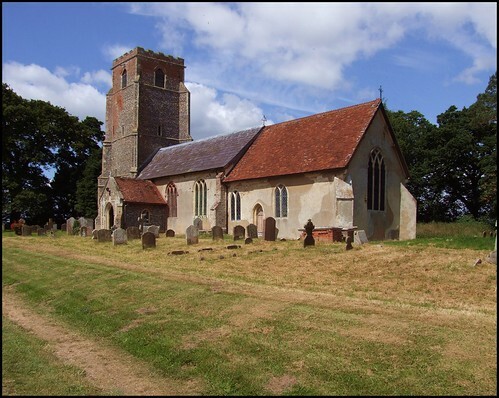 In the early summer of 2008, I set about revisiting the churches of far east Suffolk with a vengeance. I'd been looking forward to it: I'd visited them all before almost a decade previously, and although the countryside of the east of the county is not as lovely as that of south-west Suffolk, for example, it is quieter and more rambling, and you never have to cycle more than a couple of miles before you come across another church. Seen on a map, you might think that this area is hemmed in between the A12 and the sea, but the gently rolling heathland seems wilder and more remote than just about anywhere else in East Anglia. Take Blaxhall, for example: a large, rambling parish with a tiny village centre, just a few houses and a fine pub, really. The church is off on its own in the fields, and the sandy soil of the parish is cut across by narrow, ancient lanes which seem to lead nowhere in particular. One of them heads off from near the world famous Snape Maltings complex, which is actually on the Blaxhall side of the river in Tunstall parish, but the church is miles away, and you would never know. It so happened that I visited Blaxhall twice that week. As I came off the road from Snape, my heart sunk slightly to find a sign advertising a flower festival at Blaxhall church. In fact, it was very good - they usually are - and there were not really many more flowers than you would find for the average wedding. They didn't intrude, and the church was not so full of people as to make photography difficult. In fact, the people who were in the church were friendly and welcoming, and I spent far longer here than I had planned. The sunlight filled the church from the south-west, making it hard to photograph the windows, and so I resolved to return. Coming back this way a few days later, I was dismayed to feel it start to rain as I cycled up from the village. I pedalled on, thinking that it reminded me of the very first time I had ever come to Blaxhall church back in 1999. It had been on a close day in early June, the sky brooding and thunderous. Too warm to wear a coat, too unpredictable to risk going out without one. We set off from my friend Aidan's house near the busy A12, but very soon we were up to our waists in the thrusting barley field, tracing a footpath that had been discernible still, until a few days before. Now, it was becoming submerged beneath bountiful golden waves for another Suffolk summer. Me, Aidan, his six year old Jack and his mad dog Bella were on a mission. There were two churches in East Suffolk that I so far hadn't visited, and they were both within a couple of miles of each other, near Aidan's house. We crossed a railway line, then a stream; Jack startled a partridge, which exploded away from its clutch of eggs. Soon, we were on the heathland, a sea of sand leached out from the fields by a succession of wet summers. The going was heavy, the sand sinking and shifting as we stalked up the slope to the tree ridge. Day-old tracks of a fox staggered out of the hedge. A rabbit thumped once, and flashed into a hole. Ahead of us, the tower of St Peter loomed over the trees. There we were aimed. Red brick infilled swathes of flintwork - I was reminded for a moment of Carlton, and the way there that the first sight is also a tower over trees. An avenue of chestnuts led up to the east of the church, clusters and scatterings of 19th century graves on either side. Off to the south, the modern graveyard was trim, but to the north the ancient graves were a glorious wilderness of wild flowers and grasses, the tomb tops peeping above the tufts as if they were going down for the third time. Looking up at the tower, you can see that something happened here. Either a collapse, or the neglect common to medieval churches before the Victorians found them and rescued them. Perhaps, the red brick was a patch-up job of the early 18th century, and evidence inside seems to suggest this; the battlements were probably renewed later. Or possibly, the patching up was an even earlier job, back in the early 16th century, contemporary with the red brick outlines of the nave windows. The intention would have been to rebuild the tower, at the expense of a bequest; but the Reformation intervened, and it never happened. Well, it's a theory. Aidan went down into the village to collect the key, but today that is no longer necessary. Today, St Peter is open to pilgrims and strangers all day, every day. A sign on the door says This is God's House! Be welcome whoever you are, whether of this household or another way. be welcome! This is wonderful, because St Peter is a church of outstanding interest, and little known. A hint of this is to be found when you step into the porch. Blaxhall was home to the Ropes, that extraordinary creative family of farmers, artists, engineers and religious. Their work can be found in churches and cathedrals all over the world, and they are widely represented in Suffolk. In quantity, you will find the work of Dorothy, Ellen, Margaret and her cousin Margaret E. Aldrich Rope most notably at Leiston and Kesgrave, but also here. There's more of their work at adjacent Little Glemham. Even if the church was kept locked, you would still be able to see Ellen Rope's deliciously sentimental side window in the porch, depicting sunday school children. Arthur Rope tells me that it is unlikely that Ellen actually made the window herself - if so, it would be her only known stained glass work. It is more likely that one of the Margarets made it up in the London workshop to their Aunt's design. A lovely example of early 20th century piety. You step into a cool interior. The first sense is of a thorough Victorianisation, but this is realy a hallmark of how well cared for the church is. Looking up, you can see as fine a medieval hammerbeam roof as you could hope to see in a small country church. The angels on the corbels have all lost their wings, but their features are so primitive that you can't help assuming that they were carved by local villagers. The nave is like a gallery of Rope work. The bronze war memorial is also Ellen's, as is the angel and child memorial for seven year old Alfred Bates. They are all very good, but the other bas-relief of an angel and child is superb, I think. It is by Dorothy Rope, elder sister of Margaret E.A. Rope. The glory of Blaxhall, however, is the 1912 east window. It comes from the London workshop of Margaret Rope, in collaboration with her younger cousin. In the middle of it, Mary and the infant Christ sit, attended by shepherds and Saints. A sou'westered fisherman stands to her right, while behind St Philip is a shepherd with his sheep. This is a common Rope motif, the interleaving of fishermen, farmworkers, and so on, along with scenes of Suffolk rural life, among the Gospel stories. The faces of St John and St Michael are particularly striking, and have a different quality to the other characters.The Ropes sometimes used real people as models for their work; the child in the angel bas-relief a local boy, David Savage, who lived in Blaxhall all his life and is now buried in the graveyard. Margaret Rope sometimes used her brother Michael as a model, and he is St Michael in this window. Michael Rope was an engineer with the Air Ministry, and was on the ill-fated flight of the R101 airship, which crashed near Beauvais in 1931. The church of Holy Family and St Michael, Kesgrave, was built in his memory. His widow was still alive at the time of my visit there, a wonderful old lady with many memories of her sister-in-law and the other Rope artists. You can read my conversation with her on the entry for Kesgrave, a church which also has Michael's face in stained glass.It is rather curious that the bottom right panel is so crowded - all the others contain only one main figure. Arthur Rope, Margaret E.A. Rope's nephew, tells me that his brother Richard believes that the figure of St Michael was added later, as a memorial to Michael. Looking closely, you can see what he means. Whatever, the window remains one of the major 20th century works of art in all Suffolk. Its devotional, Catholic imagery has a lightness beyond the sombre gravitas of so much Anglo-catholic triumphalism of the period. Every time you look at it, you see something new. You step out of the chancel, back out of the 20th century. Here is an unusual monument inscription, of 1621. What makes it so curious is that some of the dates are missing. Presumably, it was prepared before the death of one of the intended parties, and then never filled in.It reads: Here lye the bodyes of Frauncis Saunders of Blaxhall in the County of Suffolke, Gentleman, whoe dyed the 21 daye of Janu. in the 69th yeare of his age, Ao Dni 1618. & of Katherin his wife daughter of John Soone of Wanesden (Wantisden) Wthin the same Countye, Esquire, who when shee had lived maried with the sayed Frauncis her husband 42 years and after his decease BLANK yeares widdow, dyed in the BLANK yeare of her age Ao Dni BLANK. By them also lyeth here interred Frauncis Saunders sonne of Valentine Saunders Esq one of the sixe clarks of his Mties High Court of Chauncery, who died in the 19th yeare of his age Ao Dni 1604. In memory of wch three (his brother, sister in awe & eldest sonne) the sayed Valentine Saunders Esq erected this monument Ao Dni 1621. It is safe to assume that the chaos of the Civil War intervened, separating Katherin Saunders from her home and family. She must lie elsewhere now; perhaps she remarried, and was known by a different name. There is something similar on the other side of Ipswich at Flowton. John Ropper was churchwarden here as the 17th century became the 18th, and his name, inscribed in 1711 in a roundel on the west wall of a nave, was put there to mark the restoration of the tower. This was often the case, affording churchwardens a kind of immortality after all that hard work. Romatically, a modern twin to this inscription, dated 1998, remembers Frank Shaw, who had been churchwarden for 38 years. What a lovely gesture. The Ropes are not the only brush that this parish has had with fame. It also appears in the books of George Ewart Evans. Evans was a Welshman who moved to Suffolk after the Second World War. His wife was the village schoolmistress here, and he spent his days talking to the 'rum old boys' of Blaxhall and writing down their memories. The first of his books about Blaxhall, Ask the Fellows who Cut the Hay, was published in 1956. There would be ten more. There is a strong feeling of nostalgia in Evans' writing. Even in the 1950s, he knew that his books were essentially elegaic and valedictory. He was out on the end of an event, having survived it, and he said of the ordinary villager that his knowledge is not a personal knowledge but has been available to him through oral tradition which is the unselfconscious medium of transmission. It is in his bones, you could say, and nonetheless valuable for that.... It was here at this time, and with the dressing and elaborating on it later, that I transposed the Blaxhall community in my own mind into its true place in an ancient historical sequence, keeping the continuity that was for ever changing, and for ever remaining the same, until an irreparable break substituted the machines for animal power, and put an end to a period that had lasted well over two thousand years.